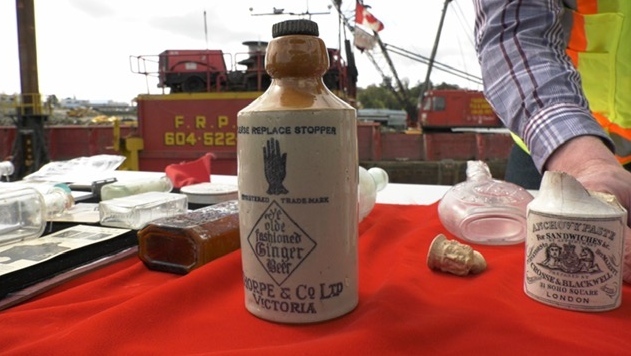 CFB Esquimalt's harbour remediation project has uncovered more than 2,000 historical artifacts. The articles date from the 1850s – when the harbour was first used for industrial purposes – to the Second World War. The base is in talks with the Royal BC Museum to find a permanent home for the pieces. Work crews have uncovered old medicine bottles, hair tonics, ginger beer, smoking pipes, lighters and a gas mask from the Second World War. "We didn't forecast finding as much," said Michael Bodman, manager of the Esquimalt Harbour Remediation Project. "Some of the first items we found were cases and cases and cases of old boot soles from World War II. We found about 20,000 boot soles and then after that kind of came a continuum of a variety of artifacts and historical items from all the past uses around the harbour." The historical items are uncovered while the soil is sifted to remove unexploded ordnance before the dirt is sent to the landfill. The remediation work started in 2016 to deal with the historical contamination over the last 175 years of industrial and military activity in the harbour. Lead, arsenic, mercury, cadmium, and fuels from past spills have been removed during the remediation. "The nice thing about finding these items and then being able to catalogue and retain them is it helps tell some of the story of the uses prior to the Royal Navy arriving here in the late 1800s through to the Royal Canadian Navy presence here," Bodman said.